Four days after downgrading Ghana’s sovereign rating from B2 to B3, ratings agency, Moody’s has downgraded Africa-focused oil producer Tullow. Moody’s also downgraded GCB Bank Limited’s local-currency deposit ratings to B3 from B2, March 20, 2015, a day after downgrading Ghana’s ability to borrow from the international financial market. In a statement issued in London and copied to ghanabusinessnews.com Tuesday March 24, 2015, Moody’s Investors Service says it has today downgraded Tullow Oil’s corporate family rating and probability of default rating (CFR) to B1/B1-PD from Ba3/Ba3-PD, because Tullow’s largest operations are located in Ghana. “The oil and gas explorer has major projects in Ghana, Ethiopia, Kenya and Uganda,” it adds. According to Moody’s the ratings on Tullow’s US$650 million 2020 and US$650 million 2022 senior notes were downgraded to B3/LGD 6 from B2/LGD 5 following the downgrade of Ghana’s sovereign rating by one notch to B3/negative on March 19, 2015. The outlook on all Tullow’s ratings remains negative, Moody’s says. Explaining the reasons for the downgrade, Moody’s notes that Tullow retains considerable concentration in Ghana, where its core Jubilee production field is located. “As a result, Tullow’s CFR remains constrained by the ratings of its largest country of operations. However, we continue to position Tullow’s ratings two notches above the sovereign rating of Ghana to reflect a number of risk mitigating considerations, including the off-shore production and direct international sales of crude, its US dollar-based pricing and its established and diversified financing framework, which does not depend on the domestic banking system in Ghana. Finally, Tullow also enjoys a limited degree of cash flow diversification with approximately half of production in other West African countries,” it says. Moody’s however, admits that Tullow’s fundamental business position remains solid, supported by its sizeable oil and gas resource base, which has been enhanced in recent years through successful exploration and appraisal programme leading to the opening of new hydrocarbon basins and significant oil discoveries, including in Ghana, Uganda and Kenya, that underpin the company’s long-term production growth trajectory. “In the near term, the rating reflects Tullow’s focus on the execution of the TEN project, off shore Ghana, that is set to add materially to the company’s high margin oil production in 2016/2017. Strong and timely execution of TEN is the key priority for the company in the next 12 months, and the project remains on target for completion in mid-2016,” it says. Bitcoin for International Petroleum Trade? Bitcoin has received mixed response from governments across the world. Some of them have accepted it and have gone a step further by accommodating them in existing and new regulations while few nations have declared bitcoin illegal and banned them outright. Then, there is another group of nations that doesn’t fall under both these categories. They are willing to wait and watch before they take a decision regarding it. Middle Eastern countries mostly belong to the third category. Bitcoin is still at its nascent stages in this region. Most people are still at the stage of understanding bitcoin’s concept and ways to use it. Surprisingly, a few businesses in the region have started accepting bitcoin as payment, which is a positive sign. Currently, Dubai and Amman are the forerunners in this region. Kuwait is catching up, and they seem to have even bigger designs in mind for bitcoin, and considering the MENA region, there is a considerable rise in the number of people using bitcoin based money transfer services instead of conventional players like Western Union and MoneyGram. A recent report titled – “Disruptive Technology: Bitcoins, Currency Reinvented” published in mid-2014 by Kuwait Financial Center (Markaz) explores the potential of using bitcoin for exports, especially petroleum. It is a well-known fact that about 80% of the Gulf economy is dependent on petroleum and its byproducts. Markaz’s report has stressed upon the possibility of using bitcoin for petroleum sales/exports. This study forms an important basis for exploring alternative payment options in case the US dollar stops being the preferred currency for trading oil and petroleum. Also, the time and costs involved in funds transfer, especially across international boundaries. Even though it was just a suggestion, the importance and timing of it is not lost. In the present scenario, the US Dollar is being slowly nudged out as the standard currency for international trade. Chinese yuan is the strong contender against the dollar, followed by the Russian ruble. China has been pushing hard to replace the dollar with the yuan. The country has in recent months signed currency swap agreements with about 28 central banks. Meanwhile, Russia has also inked agreements with countries like India, Iran, Turkey and China to trade with their respective national currencies. Ruble also has a strong influence on international trade and national economy of CIS nations. To make matters worse, the United States is being increasingly perceived as an aggressor state due to its undue geopolitical and military influence in the Middle East. United States’ stance has resulted in the destabilization of oil producing countries like Iraq, Libya and Syria, which in addition to sanctions on Iran has convinced many GCC nations to minimize dependency on the petrodollar. The proposal of using decentralized currency like bitcoin presents itself as an attractive alternative option. Using bitcoin in petroleum trade may sound attractive, but is it a viable option? What will be the repercussions of such a shift, these things have to be well thought-out before taking any step in that direction. For further reading: Will Petrobitcoin Replace Petrodollar Anytime Soon? Crude oil storage at Cushing reached 54.4 million barrels on March 13 – the highest volume on record according to the Energy Information Administration (EIA). While this has broken records for the highest volume of crude oil stored at America’s largest oil storage facility in Oklahoma – it is not the highest percent of storage utilization as working storage capacity at the Cushing has also increased over time. Crude oil storage has been increasing for 15 consecutive weeks, according to the EIA. Although inventory levels are at a record high, storage utilisation – inventories as a percentage of working storage capacity – are not at record levels. The amount of capacity being utilised at Cushing is at 77% - a 10% increase from previous reports of capacity filled in February and a significant surge from 27% in October 2014. The total storage capacity at Cushing of 70.8 million barrels represents more than 60% of all crude oil working storage capacity in the Midwest and about 19% of all commercial crude oil storage in the US. The ability to ship crude oil in pipelines both to and from Cushing has increased recently and as a result inventory levels have changed more rapidly than in previous years. 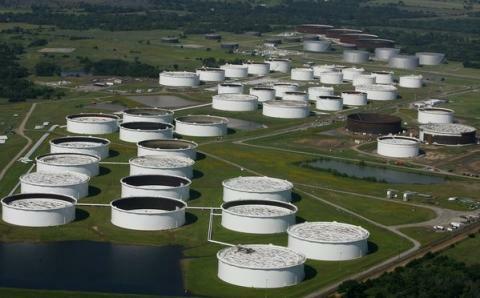 Inventory levels at Cushing in the previous two months have changed by around 2.2 million barrels. In previous years, the net weekly changes were in the range of 500,000 to one million barrels either in or out of Cushing. Crude oil prices could hit $100 a barrel by the end of 2016, according to US oil magnate T Boone Pickens. Pickens has revised his previous forecast, which said prices will hit that level as early as this year. Pickens, speaking in San Francisco, also said that the idea of 'peak oil' – the point in time at which crude oil production will go into an irreversible decline – should not be dismissed on account of the surge in US production, Reuters reported. Other regions are seeing their output decline, he added. The 86-year-old billionaire, who heads BP Capital, said on 24 March: "I think you could very well be at $100 a barrel by the end of 2016." Global crude oil prices could trade between $35 to $40 a barrel by the end of the second-quarter of 2015, one of the world's leading oil experts forecast earlier in the week. Prices could even dip beyond those levels for a brief period, warned Fereidun Fesharaki, chairman of FACTS Global Energy (FGE). The outlook could get worse if the US and Iran reach a nuclear deal. A former energy advisor to Iran, Fesharaki said there was an 80% chance of the deal going though before the 31 March deadline, which could see a further $5 drop in oil prices. Oil prices have fallen sharply since their highs last summer, amid weaker European and Asian demand and a global supply glut, fuelled by the boom in North American production. VLCC Jackpot – The Best Slot Machine In Town? We may be in a recession, but some segments of the shipping market are doing better than others. In the last few months the dry bulk market has been plumbing the depths of despair, whilst large tanker owners appear to have hit the jackpot, with rates surging to over $60,000/day. Why is it that tankers are doing so well this year? cherries needed to hit the jackpot. The first cherry was the seasonal cycle. Oil demand is generally higher in the final quarter of the year and in 2014 major importer demand was 2.2m bpd higher in Q4 than in Q2. The second cherry was the oil price, which collapsed just as the seasonal cycle got started. By the year end Brent at $50/bbl encouraged traders punting on physical oil, and where better place to put it than in a tanker? Cherry number three was slow steaming which meant that ships were at sea, not hanging around the loading zone. In December 2014 there was only one VLCC sitting spot in the Gulf on average, down from 12 in September 2014. The fourth cherry was more subtle, but equally important; tanker owners seem to be better at “finding the floor” when the market tightens. In weaker periods, the theory runs, tanker owners are less likely to counter strongly in a tight market, for fear that charterers would turn the tables when the market slackens. When the supply-demand balance is more robust, as it appears to be today, they manage things more confidently. This sounds plausible, but is it true? 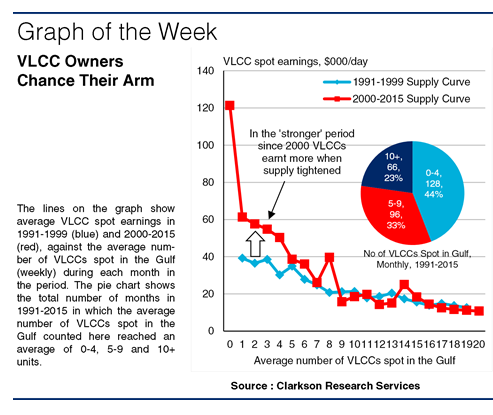 To check, we analysed VLCC spot earnings since 1991, using the monthly average of VLCCs spot in the Gulf to indicate available supply. Splitting the data at 2000, we calculated the average earnings for each number of VLCCs sitting spot in the Gulf. The results are shown in the graph. The blue line shows the spot/earnings relationship 1991-99 and the red line shows the same 2000-15. The lines suggest that with 7-20 VLCCs sitting spot in the Gulf, earnings were much the same in both the ‘weaker’ period (average earnings of $26,000/day 1991-99) and the ‘stronger’ period (average earnings post-2000 of $46,000/day). But with 6 or fewer spot ships, the earnings since 2000 have been 68% higher, suggesting that owners can take greater advantage of a tight supply situation when the overall supply-demand balance is more positive. So there you have it – two conclusions. Firstly the number of ships in the loading zone is what matters, not any “theoretical surplus”. If ships are slow steaming, such a surplus only matters if they speed up. Secondly the analysis suggests that when the supply of spot ships is tight, the wider ‘strength’ of the market impacts how owners negotiate matters a great deal. Relative to spot supply, VLCC earnings in the stronger post-2000 period increased significantly compared with the weaker 1990s. As a result, the conclusion for owners could be “stay slow and be brave”. Have a nice day. SAN FRANCISCO (MarketWatch)—The most common excuse for the recent strength in the prices for gold and oil in the wake of the Federal Reserve’s meeting last week has been the drop in the U.S. dollar, but the two commodities don’t always have an inverse relationship with the greenback. The general rule of thumb has been that commodities priced in dollars often move in the opposite direction of the currency, as moves in the U.S. unit can influence the attractiveness of those commodities to holders of other currencies. If traders want oil CLK5, +0.19% they won’t care how strong or weak the dollar is, he said. Still, he admitted that after the economic crash in 2007 to 2008, “the correlation was in lock step with oil and the dollar moving inversely with a 60%-plus correlation rate,” said Flynn. A bar chart shows that in 2009, as the ICE U.S. dollar index DXY, +0.10% weakened, both gold and oil rallied. For gold GCJ5, -0.03% influences are different, but its relationship with the greenback is complicated, too. But “in a period where every fiat currency is undergoing significant base expansion and the public is concerned about the repercussions, gold can trade higher in all currencies—even the U.S. dollar, and even if the dollar itself is rising against other fiat currencies,” he said. Irish independent Tullow Oil has secured new funding through its existing credit facilities. Through reworking someof its existing credit facilities the company has secured $450 million of capital. Tullow completd the six-monthly Reserve Based Lend (RBL) redetermination process; the quality of its asset portfolio supported a $200 million increase in lenders commitments and increased available debt capacity from $3.5 billion to $3.7 billion, despite lower oil prices. Its corporate facility was increased from $750 million to $1 billion which allowed for the company to arrange an additional $250 million in lenders commitments. It also agreed to an amendment to the financial covenant on the RBL and corporate facility to address the risk of any potential covenant breach during a period of oil price volatility and investment in production and development assets in West Africa. As a result, the Group has around $6.3 billion of currently committed debt facilities with no near term maturities. Cheap oil is great when you're filling the tank of your car or topping off fuel for your oil burner for a last-minute winter blast. But not everyone benefits from low oil prices, as Daily Finance has reported. In particular, more forms of oil production that are costlier and economic when crude tops $100 a barrel can quickly go out of favor when prices are less than half of that. Heavy layoffs had already begun in January, according to Daily Finance, hitting 31,000 by the end of the month. They were only expected to get more intense, and they have. Worldwide, layoffs have broken the 100,000 mark, as a Bloomberg story mentioned. The problem is that the oil industry interconnects with many others. Production requires equipment, which uses steel and other metals. Professionals buy and sell commodities. Refineries tend to specialize in certain qualities of oil. Slow product of something like tar sands oil and all sorts of companies that feel the pinch might start layoffs. "There's not many industries where a guy with little more than a high school education can make $100,000 a year, but that's a common pay package for drilling rig workers," wrote Forbes staffer Christopher Helman. "I'm told by people who operate a lot of drilling rigs that for every rig mothballed about 40 people lose their jobs. The U.S. rig count is down by more than 700 from this time last year." "For seven years, there was a shortage of staff," said Tobias Read, CEO of staffing firm Swift Worldwide Resources, to Bloomberg. "Now for the first time, there's a surplus. Currently almost no one is hiring." Tens of thousands of workers of all types - drillers, commodities experts, safety inspectors, pipefitters, support staff, and many others - have pulled up their roots and headed to oil boomtowns where the pay was good. As the layoffs come, not only are they hit hard, but are likely far from friends, family, and any support network. Australia has been hit hard. So has Canada, according to the Globe and Mail, where tar sands made expensive but available oil. Multiple companies in Calgary alone have announced significant staff reductions. Cutbacks are so severe that the Organization for Economic Co-operation and Development has reduced estimates of Canadian growth in 2015. The U.S. is hardly immune. According to Forbes, there have been nearly 59,000 layoffs by oil service companies. Manufacturing companies have cut 7,100 jobs. Beyond the problems the individuals and their families face is the potential impact on the U.S. economy. Not only do the layoffs mean less consumer spending, but the oil industry has represented one source of new jobs, only with good salaries, rather than the many low-paid service industry positions that have helped expand the number of jobs, but not people with much ready cash to spend. Ghana’s state-run oil firm GNPC is set to sign a loan agreement with private commercial lenders led by commodity trader Trafigura. In an interview with Reuters the company’s chief executive, Alex Mould, said the $700 million loan would help fund its expansion. Negotiations for the Trafigura-led loan began last year and is expected to close soon. “We got responses from 18 of the leading global lenders – both banks and commodity traders and we are working with the prospective lenders to close the deal soon,” Mould said in the Reuters report. The loan is seeing some criticism, not for the first time either. In November certain officials in the Ghanaian government, as well as world lending institutions and consultancy firms have expressed concern over the amount of debt GNPC is acquiring and the word “needless” has been thrown around to describe loans GNPC has been seeking. The loans are said to be necessary for GNPC to accelerate its growth and become a standalone operator in the oil and gas arena. In April 2014 Mould said $1 billion was a “good place to start” when it came to funds needed to meet its growth expansions plans. The company has joined in on a number of exploration assets through its GNPC Exploration and Production Co. Ltd. It will also be taking its place onshore and plans more than a few wells there to determine if the country’s offshore bounty extends onshore. Cameroon soldiers stand guard at a lookout post as they take part in operations against the Islamic extremists group Boko Haram, their guard post is on Elbeid bridge, rear, that separates northern Cameroon form Nigeria’s Borno state near the village of Fotokol, Cameroon. N’Djamena, Chad (TFC) – As of this weekend, the Nigerian extremist organization, Boko Haram, has officially pledged its allegiance to the Islamic State (ISIS) of Iraq and Syria. This news comes only 2 weeks after the United States Africa Command (AFRICOM) began its “Operation Flintlock 2015″ in Chad’s capital city. In fact, the “diplomatic” military convention concludes today. Two days after Abrubaka Shekau, leader of Boko Haram, announced his solidarity with ISIS. “We announce our allegiance to the Caliphate….and will hear and obey in times of difficulty and prosperity,” said Shekau on Saturday. Boko Haram, roughly translated to “western education is forbidden,” is an extremist Sunni sect that has been strengthening in numbers and reeking havoc throughout Northwestern Africa, primarily Nigeria, Chad, Tunisia and Cameroon, since 2009. On March 6, the Fifth Column reported that Saudi Arabia is requesting US ground troops as “a self-serving effort to keep the nation of Iraq as a buffer against Iran.” The article explains the differences between the competing religious sects of Iraq, home of ISIS, and how the divided nation is on the brink of dissolution. How convenient for the US that just as its media-darling terrorist enemy is beginning to lose influence, another group of Islamic extremists has announced its undying allegiance to the group. This time, however, the scary Islamic terrorists are from the oft-neglected region of genocide, despair and division: Africa. Both groups are Sunni. Both practice Sharia Law. Both are smokescreens for the real reasons the US is interested in either region: Oil and Natural Gas. Nigeria is where Boko Haram originated. It started as little more than a street gang in the early 2000s. However, its members and tactics grew increasingly more extreme over the course of the first decade of the new millennium. In 2009, the former leader of Boko Haram, Mohammed Yusuf, was publicly executed by Nigerian Police. Yusuf was replaced by Boko Haram’s current leader, Abrubaka Shekau. 2009 and 2010 saw some of the worst violence in Nigeria in recent memory. Boko Haram militants clashed with Nigerian soldiers in an attempt to free their spiritual leader from prison. During the skirmish, Boko Haram saw at least 30 of its members killed and the death of one Nigerian soldier. Less than 1 year later, Shekau led an assault on Bauchi Prison, killing 5 people and freeing over 700 inmates. Bold, violent attacks against the Nigerian United Nations building and several police and military outposts followed into 2011. As the western part of the world celebrated the New Year with champagne and novelty sunglasses, hiding tipsy eyes full of hope as they watched the ball drop in Times Square, Boko Haram ravaged the fishing community of Baga, killing nearly 2000 people in the first days of January, burning the village to the ground like Norse Vikings. It is estimated that between 5000 and 7000 lives have been lost during the rise of Boko Haram and its clash with the categorically corrupt Nigerian Military and Police. The article claims that Nigeria’s State Security Services issued a statement in November of 2012 stating that 4 “criminal syndicates” were sending threatening messages to the Nigerian Government in the name of Boko Haram. 3 of those 4 “criminal syndicates” were run by Southern Nigerians that do not even identify as Muslim. One of which has leaked information to the US Embassy that caused Boko Haram to retreat from and evacuate a hotel it had captured. Herskovits goes on to state that the root cause of this inexcusable violence lies in the overwhelming poverty and hopelessness of Nigerian society. Nigeria has the strongest, most robust economy in Africa. Despite this fact, 70% of its populace lives on less than $1 a day. Massive wealth. Massive economic inequality. Terrorists blamed for the entirety of a country’s problems. Does any of this sound familiar? Historically, the US has been mostly ambivalent to the genocide, terrorism and famine that is daily life for most of Africa. Several years of constant pressuring were needed before the crises in Sudan, Uganda, and Rwanda were even recognized as an issue by the US Government. That is all about to change, but not for humanitarian reasons. World Socialist Website reported earlier this month that US and NATO forces began a massive series of War Games simulations during Operation Flintlock 2015. The simulations will focus on “interoperability and capacity-building among African, Western and US counter-terrorism forces,” according to the Pentagon’s press release. What regions are the focus of these War Games? None other than Nigeria, Chad, Cameroon and Tunisia, the regions being affected by the Boko Haram insurgency, of course. US and African military officials made it clear that these “War Games” could translate to actual warfare against Boko Haram, or more accurately the regions associated with Boko Haram, in the future. Under the banner of “Warfare” the diplomatic title of Defense News’ article on the military expansion in West Africa reads, “Us Special Ops Build Bridges in Africa.” The article says 1300 troops from African and NATO countries are gathering for a “variety of tactical engagements.” 673 African forces, 365 NATO forces and 255 US personnel gathered in Chad to take part in “training objectives [that will] help build relationships reinforcing the capacity of participating militaries to secure a stable environment for growth and development in the nations of the region,” says Chadian Brig. Gen. Zakaria Ngobongue. Currently, the US imports about 25% of its crude oil from West Africa. KPMG goes on to say that the percentage of oil exported from Africa to China and India has steadily increased since 2007. In 2011, exports to China and India were up from 10% and 5%, to 14% and 8%, respectively. Considering China’s burgeoning economy and expanded presence in the region, as well as its shaky alignment with Russia, it only makes sense for the US to pounce now and crush the region into servitude before a competitor gets the chance. KPMG’s report says the biggest investment opportunity lies in the construction of an oil refinery network. Libya has the largest oil reserves, but due to civil war and NATO bombings, exporting these reserves is difficult. Nigeria, however, is the continent’s leading oil exporter, despite its smaller reserves. Be that as it may, it has virtually no refining system established. It exports crude oil only to have to import refined oil back into the country at an extra cost. KPMG states that corruption, theft, and poor maintenance prevent any sustainable refining infrastructure from existing. If you live in an aluminum shack with no plumbing built by missionaries, I would venture to guess cheap oil is not your primary concern. You may be wondering who or what KPMG is. After scouring its website for an answer to that question I found no definitive conclusion. It appears to be some kind of analytics subsidiary of a private equity firm. It operates out of the Cayman Islands under the umbrella of KPMG International, which operates out of Switzerland. The Cayman Islands and Switzerland are the “economically liberal” tax-haven states favored by bankers and politicians like Mitt Romney. Romney and his equity firm, Bain Capital, were indicted for Racketeering in January. Bain Capital had at least $30 million in 138 individual equity funds in the Cayman Islands as of 2012. That has to be a good sign, right? KPMG released another report in 2013 outlining the possible fiscal benefits of launching an invasion…I mean refining venture in Nigeria. Despite the rampant corruption of the Government, KPMG is delighted at the many tax breaks that apply to foreign investors. The Nigerian Investment Promotion Commission Act (NIPC) of 1995 completely deregulated the flow of capital from Nigeria to foreign investors. Under the presidency of Goodluck Jonathan, a plan known as 20:2020 has been put into effect. The goal of 20:2020 is to make Nigeria one of the top 20 economies by the year 2020. Goodluck Jonathan is a Christian politician born in South-Nigeria. He took office in 2010 and has consistently ignored the needs and demands of the impoverished, predominantly Muslim, regions of Northern-Nigeria. The epicenter of Boko Haram. 1. Nigerian companies with a minimum of 25% foreign equity are exempt from payment of minimum tax (tax paid by a company that has no taxable profit or whose taxable profit is lower than the minimum tax). 2. Income/interest earned from federal government short-term securities is exempted. Income/interest earned from bonds issued by the federal, state and local governments, and corporate bodies (including supra-nationals) is also exempted from the taxes. 3. Proceeds from the disposal of the bonds and securities listed are exempted from Value-Added Tax (VAT). 4. Investment allowance of 10% on qualifying expenditure on plant, machinery and equipment. 5. Rural investment allowance of between 15% and 100% of the cost incurred in providing facilities/ infrastructure in rural areas. 6. Capital allowance of 95% in the first year in respect of plant and machinery purchased to replace old ones. 7. Tax exemption of between 40% and 100% of the interest earned on foreign loans advanced to companies in any industry, where the terms and tenure of the loan satisfy the conditions specified in the law. 1. Capital expenditure on qualifying assets incurred during the tax relief period is treated as having been incurred on the first day following the tax relief period. Pioneer companies are therefore able to fully claim capital allowances on such assets. 2. Tax free dividends during the holiday period. 3. Losses in the relief period may be set off against profits after the end of the period. It is easy to see how Goodluck Jonathan could stand in front of a podium and pitch this information in a positive way. Foreign investors are helping to build a strong Nigerian economy! It’s easy to see how this propaganda could benefit his campaign. It is easy to see how corrupt, corporate influence is about to devastate an already unstable region. It is easy to see the parallels between Nigeria and it’s spiritual-predecessors in the Middle East. The reality is fairly straightforward. Saudi Arabia is using its controling-stake in the oil market to pit Russia, China, and the US against each other in a bidding war. Nigeria, however, seems to have made it perfectly clear that its loyalty lies with the US. Perhaps it learned from Saudi Arabia that any and all evil is forgiven when Uncle Sam’s pipelines pump your crude. American dependence on oil is not going to end any time soon. We consume almost 19 million barrels of oil per day. Despite overwhelming opposition, fracking continues to ravage the southern part of the country, causing near-daily earthquakes and explosions in states like Oklahoma. The Koch brothers spent almost a billion dollars to buy the Republican Party and ensure their Keystone XL pipeline gets built. Oil’s closest ally, the Defense Sector, will undoubtedly be right behind them to jump on the lucrative African bandwagon. Nigeria’s defense budget is 25% of its GDP. Oddly enough, Nigeria’s GDP has more than tripled in the last decade or so. It’s gone from less than $100 billion in the 90s to $414 billion today. One more thing ol’ Goodluck can attribute to himself during his campaign. Last September, the Pentagon opened its third drone hangar in West Africa, its second in Niger, northern neighbor to Nigeria. The construction of this hangar came in tandem with an uncharacteristic push from the French military. The French permanently deployed over 3000 troops to West Africa in a “counter-terrorism” measure after the disappearance of hundreds of school girls in Nigeria, attributed to Boko Haram, last fall. According to the Washington Post, the US and France were “working hand in glove as they steadily expanded their presence in impoverished West Africa.” French President Francois Hollande announced his intention to further beef up France’s military presence in Mali, Chad, Niger and Burkina Faso. Predator drones are manufactured by General Atomics. General Atomics has a long, storied history of being acquired and sold by oil companies like Chevron, Dutch Shell, and Gulf Oil. Other defense contractors like the Carlyle Group, Oshkosh, and Dyncorp make billions from their weapons being sold to the Saudis and UAE. Dyncorp, specifically, was accused of being involved in human trafficking in 2006. Dyncorp also had a special contract under Operation Iraqi Freedom that gave it the ability to sell the weapons that murdered the population and destroyed the country and then provide “humanitarian aid and reconstruction to conflict and post-conflict areas” through a partnership with World Wide Humanitarian Services (WWHS), a subsidiary of Dyncorp. That’s like selling someone an axe, making them pay you for cutting their leg off and then making them pay you for sewing it back on. Then, writing off the surgery as a tax-deductible act of charity. In our world, war is charity. True, evil brilliance. Why not take this business model to Africa? It is easy to imagine the future awaiting Africa. It is easy to imagine the Koch brothers engineering the election of the next George Bush using the same, tired hyperbole to generate fear and hate for an entire continent. It is easy to imagine “patriots” waving flags in support of “American Liberty” while drones circle above the heads of the poverty-stricken favelas of Africa painting digital targets on the heads of people who have nothing to do with any of this. It’s all so familiar. The world is a desert snowglobe being shaken by the hands of oil companies and defense contractors. No matter how or where the sand settles, they always come out on top. Equity markets started off this year by falling. They rallied in February, working their way back into the green. The Standard & Poor's 500 Index now is up about 1 percent for the year. The reasons gold prices can't seem to gain any traction are many: Job creation has been robust, inflation is low and the Federal Reserve is widely expected to begin the process of easing back on monetary accommodation -- strengthening the dollar and further reducing gold's appeal. As we noted late last year, the gold narrative has failed. The promised hyperinflation that was supposed to send gold soaring never arrived. Instead, we had disinflation, with a threat of global deflation. Other stories were posited by traders who were long on hope but short on cogent analysis. The ballot proposal requiring the Swiss National Bank to hold at least 20 percent of its 520 billion franc ($523 billion) balance sheet in gold was rejected by Swiss voters. Another tale: India was going to cut its import duty on gold, leading to soaring demand. But India decided to maintain the duty. The latest bout of wishful thinking was that a gold version of the new Apple watch would consume “up to 756 metric tonnes of gold per year . . . this equates to roughly a third of gold's total annual global mine supply," according to a company called Goldcore. As my Bloomberg View colleague Mark Gilbert explained yesterday, that fantasy was laughable on its face. The most damaging slice of reality for the gold-bug narrative has been the strength of U.S. dollar. Yes, I know, we were promised the collapse of fiat currency generally and the U.S. dollar specifically. Quantitative easing and zero interest rates were going to be the end of paper money, and mark at long last a return to the gold standard -- the one true currency. Alas, that was not meant to be. The greenback is now at 12-year highs versus the euro; at less than 1.08, it is nearing parity, which was last seen in 2002. The dollar also is at multiyear highs versus the Japanese yen. Against a basket of major currencies, the greenback is up more than 8 percent so far in 2015, after rising more than 12 percent in 2014. Although stocks have gained little this year, there may be more potential and for some of the same reasons that gold has underperformed: Job creation has been robust and inflation is low. Why more potential? More hiring and rising wages are likely to help revive sluggish retail sales. Durable goods have been especially soft, and they historically tend to gain as hiring increases. Capital investment by corporate America has also been soft. But analysts have been talking about a long overdue increase in business investment, which would goose economic activity. Perhaps the most significant difference between stocks and gold is where they are in their long-term cycles. Gold, after a rally that lasted a decade, has been declining since August 2011. Stocks have been gaining for the past six years after a huge crash in 2008-09. If the economic trends of the past few years persist, they favor stocks over gold. Brent crude futures dipped below $58 a barrel on Tuesday as the dollar hit multi-year highs and the oil market remained hobbled by oversupply and weak demand. The U.S. dollar hit a near 12-year peak against the euro and an eight-year high against the yen, hurting commodities priced in dollars by making them more expensive for holders of other currencies. At 7.31 a.m. EDT, Brent was down 79 cents at $57.74, while U.S. crude was 45 cents lower at $49.55. Traders and analysts said there was a risk of further falls as speculative net long positions were so high, particularly in Brent, whilst the fundamental picture remained one of weakness with no sign of any slowdown in production. "In order to balance the market we need the supply glut to be brought down, by rising demand or lower supply," Ole Hansen, senior commodity strategist at Saxo Bank, said. Demand from China, the world's second-largest oil consumer, slowed in February as the Lunar New Year holiday cut into shipping volumes. At the same time, global refinery maintenance is about to peak, with global offline capacity assessed at 5.7 million barrels per day (bpd) in April, according to Energy Aspects. "Most of the supportive factors for Brent are starting to fade," they said in a note on Tuesday, pointing out that supplies hit by weather and technical issues were returning. Libya is expected to export more than two million barrels of crude oil this week from two ports in the east, where output has topped 245,000 bpd. "This could add to the bearish picture in Brent," Carsten Fritsch, an oil analyst at Commerzbank, said. He said Brent had tried and failed to regain the $60 a barrel level on Monday, which triggered selling from short-term investors. "Brent could see further declines now, given the large overhang of speculative long positions," he said. U.S. crude has faired a little better helped by a report from market data firm Genscape that showed a modest stock build last week at the Cushing, Oklahoma, delivery point. Investors are waiting for weekly U.S. inventory reports from industry group the American Petroleum Institute and the U.S. Department of Energy's Energy Information Administration to see if the Genscape numbers are confirmed. According to a Reuters survey, U.S. crude stocks are set to extend their record build for a ninth week. TORONTO, (Reuters) - A Canadian National Railway Co train carrying crude oil that derailed near the northern Ontario community of Gogama early on Saturday is still on fire, the company said late on Sunday. West African countries have started to take a keener interest in ship to ship (STS) transfer operations. Those being scrutinised are usually taking place in national waters (12 mile zone) or in the countries Exclusive Economic Zone (EEZ - 200 miles), warned leading insurance service provider Skuld. · Concerns over smuggling and evasion of duties. · Security concerns with respect to piracy and other seaborne crime. Skuld's correspondents in the Republic of Congo have advised that the local merchant marine authority must be given advance notification of any STS operation and provide approval, before it can go ahead. A fee of up to FCFA 5 mill (about €7,600) may be charged for this approval process. A STS performed without an approval may result in significant fines and other legal action being taken. Further information received indicated that the Angolan authorities also require advance clearance for an STS, which specifically means notifying the Angolan navy of any planned operation. · Names and IMO numbers of involved vessels. · Likely date of the operation. · The location of the operation. · Identifying the name the cargo to be transferred and the quantity. Upon completion of the operation, a statement of facts (SOF) should be submitted to the Angolan Navy. A failure to comply with these requirements may lead to an arrest of the vessel, fines and/or other consequences. The decision to agree to an STS, be it in advance of a voyage or on an ad hoc basis, should always follow a careful risk management analysis, Skuld said. There are a number of physical STS issues that need to be addressed in order to ensure any such operation is done safely. Including a pre-STS assessment of the planned operation, as well as a careful monitoring throughout. There is a continuing risk of piracy in certain areas along the West Coast of Africa. While most incidents appear to be in and around the Gulf of Guinea, there have been reports of incidents as far south as Angola. Vessels that are stationary during a STS operation may be at particular risk, as they cannot seek to use navigation to fend off of an attack. Furthermore there have been instances where a purported STS operation may have been a ruse to lure a vessel in to an ambush, Skuld warned. Therefore it is advisable to seek to conduct operations in areas where protection can be afforded by authorised bodies of the local coastal state. It is important to note that it may not always be possible to have foreign security personnel on board a vessel, armed or unarmed. **Skuld has also announced that the P&I club has added 10 mill gt following the mutual renewals, which were completed on 20th February. Ståle Hansen, Skuld president and CEO, said: "The 2015 renewals demonstrate that we have a solid base of loyal members who not only renew their policies with Skuld but who also bring new tonnage into the club. On top of that, attracting new and high-quality members and welcoming some previous members back proves that Skuld is an attractive partner in the marine insurance market." Crude prices continue their downward spiral with OPEC hitting four year lows on its basket price last week. The organization saw its basket price hit $70.80 per barrel on November 27, almost a $3 drop from the previous day’s $73.70. While the drop has allowed consumers in the US to enjoy lower gas prices at the pump, the dip is hurting share prices of energy companies as well as the currencies of some countries. On the US’ NYMEX light crude oil has fallen to lows not seen in years, trading at $66.15 per barrel on November 28. Across the pond in London, Brent crude fell below $75 per barrel for the first time since September 2010. The GOP-controlled Senate failed Wednesday to override President Obama’s veto of Keystone XL pipeline legislation but vowed to continue to fight to complete the project. The vote was 62-37, five votes short of the 67-vote super-majority needed to override a presidential veto. The bill turned back by the president would have approved the controversial pipeline. But some lawmakers are looking at other ways to muscle the legislation through. “If we don’t win this battle today, we’ll attach [the legislation] to another bill and win the war,” North Dakota GOP Sen. John Hoeven, a major sponsor of the bill, said before the vote. Hoeven is considering attaching the Keystone measure to a highway infrastructure bill. The completion of the Canada-to-Texas pipeline has been a contentious Washington issue for the past six years. Republicans and other supporters argue the project would create tens of thousands of good-paying jobs and help the United States become less dependent on foreign oil. Democrats and other opponents say that drilling for the oil in Canada’s tar sands will emit too much greenhouse gas and contribute to global warming. The Senate passed the legislation Jan. 29 -- just weeks after Republicans officially took control of the chamber from Democrats, who for years had held up the effort. Obama later vetoed the legislation, making good on his vow that no final decision could be made until the State Department completed its impact studies. “By vetoing the bipartisan Keystone jobs bill, President Obama sided with [the] moneyed special interests over the middle class,” said Senate Majority Leader Mitch McConnell, R-Ky. But Sen. Barbara Boxer, D-Calif., earlier this week told The Hill newspaper that the effort to override the veto was a “ludicrous idea” and rejected the idea of attaching Keystone to the highway legislation.